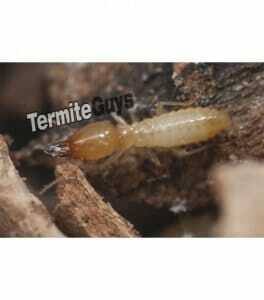 This termite species is right at the top of the Termite Guys hit list. They are wanted for mass destruction of property in Brisbane and right throughout Australia; homes, fences, retaining walls and many other timber structures are frequently destroyed by this group of master villain termites. In fact this group of termites costs Australians more money than any other termite; they are a problem not just restricted to Brisbane or South East Queensland. Coptotermes are one of the most voracious of the termite species and are not particularly choosy. When they arrive they come in numbers, healthy termite colonies can contain upwards of 3 million individual insects. Open up some damage (we do not recommend you do this) and the soldier termites will tenaciously defend the breach. A signature of these cretins is the milky white “exudate” or glue that the termite soldiers exude from their foreheads. Even as they start to destroy your wall frame near the entry point, they are already exploring the rest of the house for its food potential. You don’t have long, a crew this big doesn’t take long to rumble into life. Coptotermes are capable of the termite equivalent of ‘blitzkrieg’, shock and awe for the unfortunate home owner. The outcome can be very grim if an attack is not detected early. Usually starting at ground level, they’ll eat all the way up to the top of the roof and start down the other side. Skirting board or bearer, it’s all just timber to them. Hardwood is no deterrent. In some cases this termite species will choose hardwood timbers like mountain ash over softwood timbers like pine. Coptotermes can build mounds or arboreal nests up north but rarely get the chance to infest pine trees. In suburbia, they are more likely to nest in a hardwood tree like a gum, ash or mango! They are capable of consuming even the most resistant timbers like cypress pine. These guys are enthusiastic and determined and will eat through gyprock, rubber and other substances if they think that there is a meal on the other side. This can result in muddy lumps appearing in unusual places. Large trees are often victimized. CSIRO estimate that as many as 70% of trees that fall in storms are a direct result of termite damage. Coptotermes hollow as many as 85% of trees in Northern Australia; it isn’t quite as high in the Brisbane area but still a huge proportion (their partners in crime Schedorhinotermes sp. account for a large number here). Treatment of infested trees can halt new excavations but not reverse existing damage. This termite species is more commonly found in areas close to bushland. Increasing numbers of homes are requiring termite treatments in suburbs like Mount cotton, Capalaba, Murarrie, Forest Lake and Calamvale which seems to coincide with the expiration of the original chemical treatments as these estates age 10+ years. Coptotermes are famous for relentlessly testing termite treatments. Older, repellent style barriers are routinely overcome. Only the best quality treatments and modern chemicals such as Termidor and Exterra baits can conquer these super criminals. 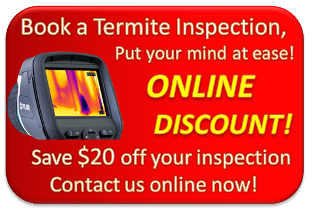 Save $20 off your inspection by filling out our easy online enquiry form. We have the latest equipment for detecting termites inside the home. 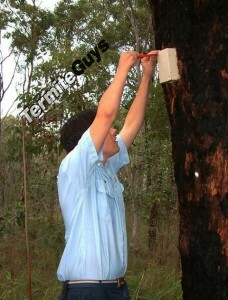 As our name implies, we are skilled Termite Guys and are fully equipped to detect, eradicate and prevent Termite attack.